It’s our 10th Anniversary. We are so excited for how far we’ve come, so it is only fitting that this year the beneficiary of Filmed by Bike is NW Documentary. 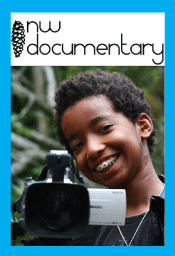 The non-profit organization helps people tell their stories through film and video. NW Documentary recently launched a new Bicycle Documentary class, being taught by Joe Biel, a seasoned local filmmaker and cyclists who has many times submitted pieces to Filmed by Bike. Joe knows that getting the best shots for bike-related movies means creative shooting techniques and he’s excited to share this knowledge with the students. In honor of this brand new class, Filmed by Bike is supporting NW Documentary and hopes to raise mountains of awareness for the impressive work they do. We highly recommend you attend the upcoming Homegrown Doc Fest, their showcase of student work that’s always truly impressive. The event is April 20 at the Mission Theater.